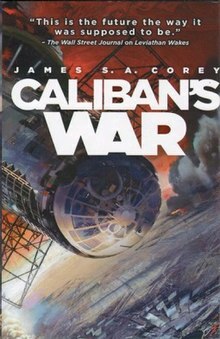 Caliban's War is a 2012 science fiction novel by James S. A. Corey (pen name of Daniel Abraham and Ty Franck). It is about a conflict in the solar system that involves Earth, Mars, and the Asteroid Belt (colonies of people living on asteroids, referred to as "Belters"). It is the second book in The Expanse series and is preceded by Leviathan Wakes. The third book, Abaddon's Gate, was released on June 4, 2013. Eighteen months after the events of Leviathan Wakes, the solar system is in a precarious balance while they watch unknowable events unfold on the planet Venus. Earth and Mars are still poised for battle, and someone didn't recognize the warning that the Eros Incident held for humanity. James Holden is the captain of the salvaged Martian warship Rocinante. He and his crew have worked for the Outer Planets Alliance for 18 months since what’s become known as the Eros Incident, and the job just doesn’t feel right. While assisting a botanist in the search for his daughter, Holden comes across signs that people are still trying to tame the protomolecule, and the threat comes very close to home. Breaking his OPA ties, he becomes an ever-more-important piece in the four-way chess game for who will run the solar system. Chrisjen Avasarala is a high-ranking UN official who knows how to get things done. Plugged in to all sources of information, she’s simultaneously monitoring events on Earth, Mars, Ganymede and Venus, though the last one is the toughest to predict what will happen next. Seeing shifts coming but not able to completely grasp what they mean, she accepts a post that takes her away from the action knowing she is playing her expected part until it is time to do the unexpected. Then, she meets James Holden for the first time aboard his ship, trying to defuse a solar-system-wide war. Bobbie Draper is a Martian Marine stationed on Ganymede, one of Jupiter’s largest moons and known as the breadbasket of the outer planets. After she witnesses the brutal defeat and destruction of military forces on both sides of a conflict by a third party, she is taken to Earth to participate in peace talks, but doesn’t follow the party line and gets in trouble with her leaders. Now helping Chrisjen Avasarala, she must quickly adapt to interplanetary politics and office intrigue. Later moving her duties to space, her military training comes in handy once again. Praxidike Meng is a botanist working on Ganymede when tensions erupt. His daughter is lost in the chaos, and he finds information that she was actually taken from her daycare before the action. He tries to find her in the decaying conditions of his home, but latches on to James Holden as a source of hope. Eventually becoming the face of the crisis at Ganymede, his efforts to find his daughter’s abductors have interstellar ramifications. On Ganymede, Mei Meng is kidnapped from her preschool by her doctor, and we are introduced to a protomolecule-modified super soldier. Several hours later, UN and Martian space marines are attacked by this super-soldier who effortlessly kills all of them except for Bobbie Draper, a Martian marine. In the ensuing chaos, the UN and Mars begin a shooting war which leaves Ganymede in chaos. In the aftermath, Praxidike Meng fruitlessly searches for his daughter in the midst of food shortages and the breakdown of the social structure in the colony. Several months later, James Holden and the crew of the Rocinante are tasked with delivering emergency aid to Ganymede. Holden is spotted by Meng in the midst of a food riot who asks them to help him find his daughter. The crew agree and are able to trace her kidnappers to unused tunnels on the moon. Holden, Meng, and the Rocinante's mechanic Amos Burton explore the tunnels and discover a secret lab. In the midst of a shootout with lab security, they inadvertently and unknowingly release another super soldier who kills lab personnel while some of the personnel are able to evacuate through a secret spaceport. In the wake of the battle, Rocinante's crew find the corpse of Mei Meng's friend who was being treated by her same doctor for immunodeficiency, and remnants of the protomolecule. The crew rush to escape the station as more chaos erupts around them, and they are able to make it back aboard the Rocinante. In the meantime, peace talks between the UN and Mars are occurring on Earth. Draper is brought along as the only living eye witness of the super soldier's attack. She violates diplomatic protocol during a meeting and is dismissed by the Martian delegation, to then be hired by Chrisjen Avasarala, who is leading the UN negotiations. Draper discovers that Avasarala's assistant is betraying Avasarala, leading Avasarala to conclude that her superiors are trying to get rid of her, from which she deduces that a group within the UN is responsible for the super soldier. Avasarala allows her to be placed on a slow-moving yacht headed to Ganymede on an ostensible relief mission but whose true purpose is to isolate Avasarala, and she brings Draper along with her as a bodyguard. Holden and his crew decide to return to Tycho station to repair the ship and to get more information. During their trip, the crew discovers that one of the super soldiers stowed away in their cargo hold. They are able to lure the creature out using radioactive bait before vaporizing it with the Rocinante's exhaust. Unfortunately, the ship gets damaged in the encounter, but the crew learn more about the super soldiers. The Rocinante is able to make it back to Tycho station where Holden confronts Fred Johnson, who he believes controls the only other sample of the protomolecule. Johnson denies involvement with the events on Ganymede and fires Holden and his crew. Jobless, the crew helps Meng release a video explaining his plight and to ask for donations. Mei Meng becomes the face of the events happening on Ganymede, and they are able to raise enough money to have the Rocinante continue the search for Meng's daughter. In addition, they receive information about Mei's doctor, and Praxidike deduces that the super soldiers are being created on a base on Io. With the Rocinante repaired, the crew sets out to recover Meng's daughter. On board the yacht, Avasarala does her best to be a thorn in her superior's side, with little effect until Meng's plea goes out. She finds out that UN ships are heading to intercept Holden. When she tries to warn him, the crew of the yacht prevent her from doing so, claiming that the yacht's communication systems are broken. The crew also refuses her demands to get the yacht repaired, which gives Avasarala the pretense to claim that the crew are kidnapping her and allows her to have Draper take control of the vessel. Avasarala sends a warning to Holden, and she and Draper board a racing pinnace to meet the Rocinante. Avasarala and Draper board the Rocinante and meet with Meng, Holden and his crew. They share notes of the protomolecule super soldiers and realize that they are several days away from being destroyed by the UN detachment sent to intercept the Rocinante. Avasarala convinces the crew to let her send this information to her contacts within the UN to prevent an all-out war. Draper and Avasarala convince the Martian fleet monitoring the UN ships to help protect the Rocinante. This culminates in a space battle between the UN ships sent to intercept the Rocinante, the Martian ships sent to monitor the UN ships, and a second UN fleet loyal to Avasarala. With the UN Secretary General recalling the UN Admiral hostile to the Rocinante, the battle ends in victory for the Martians and the UN faction loyal to Avasarala. The crew then lands on Io, where Amos and Praxidike rescue Mei Meng along with other immunodeficient children, while Draper kills a protomolecule super soldier using knowledge about the super soldier's capabilities. The crew heads back to Luna, where the people responsible for the protomolecule research are brought to justice. Chrisjen Avasarala is promoted, Praxidike Meng is hired to oversee efforts to restore Ganymede, Bobbie Draper returns to Mars, and the Rocinante takes a contract escorting a supply ship to Ganymede. Throughout the story, the solar system had been watching changes on Venus, which culminate with the launch of something unknown as the book ends. Critical reception for Caliban's War was predominantly positive, with Kirkus Reviews noting that the book could be enjoyed as a standalone novel but was "best appreciated after volume one". Wired.com's Geek Dad and Publishers Weekly both praised the novel, with GeekDad citing the book's "believable human personalities and technology that is easily recognizable" as a highlight. Tor.com gave an overall positive review for Caliban's War, but noted that there was "some rather tiresome dialogue in the cards, as well as an overabundance of laughably transparent politics, and a couple of at best cartoonishly characterised bad guys". ^ Alexander, Niall (28 May 2013). "The Expanding Expanse: Abaddon's Gate by James S. A. Corey". Tor.com. Retrieved 3 June 2013. ^ Wright, Eddie. "Interview: James S.A. Corey Talks 'Caliban's War'". MTV Geek. Retrieved 21 October 2012. ^ "Review: Caliban's War". School Library Journal. Retrieved 21 October 2012. ^ "Russell Letson review James S.A. Corey". Locus Online. Retrieved 21 October 2012. ^ "Review: Caliban's War". Kirkus Reviews. Retrieved 21 October 2012. ^ "Review: Caliban's War". Publishers Weekly. Retrieved 21 October 2012. ^ Kelly, James. "The Expanse, Book 2: Caliban's War Review". Wired.com. Retrieved 21 October 2012. ^ "Popcorn Space Opera: Caliban's War by James S. A. Corey". Tor.com. Retrieved 21 October 2012.